Voicemail is dead, long live voicemail. According to a recent Harvard Business Review blog post, using voicemail in today’s world of caller ID, missed call lists, and text messaging is as anachronistic as writing with a fountain pen. Further, the post posits that eliminating enterprise voicemail would significantly increase productivity because of the large amount of time currently spent on leaving and retrieving uncommunicative, unintelligible, or otherwise just plain bad messages. All humor aside, voicemail does still have value. As a busy small business owner, you likely do not have the time to answer every call that rings your way, and you will likely not call back an unknown number on a missed call list. So a clear, concise, and informative voicemail message can give you enough information to decide whether a call back is worth your time. 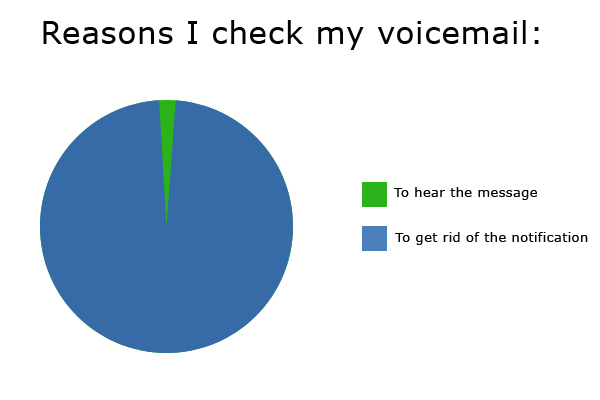 A bad voicemail message can be deleted expeditiously, (often just a few seconds into an interminable ramble). Conversely, if you are making sales calls yourself, learning how to leave that clear, concise, informative, call-back worthy message is a critical business skill. The following posts provide some useful advice on what to do, and what not to do, when leaving sales-related voicemail. 5 Voicemail Tactics That Will Get You More Callbacks provides tips for an effective call, including not starting the call by introducing yourself. By leaving your name, company, and number to the end, you can start the call with a powerful value proposition for returning your call. 5 Stupid Voicemail Mistakes and How to Avoid Them identifies common errors and what you should be doing instead. Of note is the suggestion to make certain that you are using a quality telephone when leaving your message, because a cheap device can make your message sound horrible. Sales Voicemail Tips & Strategies provides 15 tips on how to “leave the best voicemail of your life” including the best hours of the day to call (6:45 to 8:00 a.m. and from 4:30 to 6:30 p.m. ). The post notes that “driven people” are typically at work during those times, and that appearing to be working during those hours can make a good impression on your prospect. Cold Call Voicemail Strategies is a 30 minute webinar from the 2013 Inside Sales Virtual Summit. Watch the video to see examples of poor sales voicemails and to gain an understanding of what works and what doesn’t work for voicemail at different stages of the sales process. Like everything else, picking the proper tool for your message is the key to success. If a situation is better served by an email or text message, then of course use them. If you don’t think a voice message is appropriate for the information you need to communicate, then if your call goes unanswered don’t leave one. But if you can leave an effective message, then by all means continue to use voicemail. The reports of its death have been greatly exaggerated.